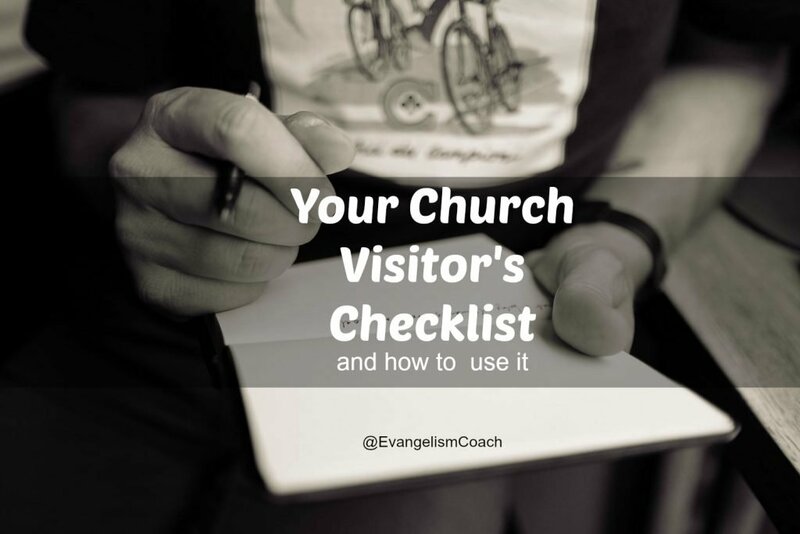 Your church visitor will have an invisible list in their head that they will use to evaluate your congregation. As a leader of hospitality and welcome ministry, what can you do about that list? How can you respond or be prepared? Our family has begun once again to visit local churches. For the last two years, we found a spiritual home in a new church development for Spanish speaking immigrants. But the tough decision has been made to close. Thus, we are once again looking for a church, a spiritual home, a place where we can give our life away in the kingdom of God. As we have had to church shop two times in two years, I discovered that we have a list of what we want in a new church family. Our list the filter we bring to in our quest to find a church where we will give our life away, where we will give our tithe, find a community of care, and where we will serve with volunteer hours. We’ve visited the same one for three Sundays now and realize that list is shaping what we experience. Your church visitors have a list. They may be a Christian family looking for a new spiritual home because a job transfer brought them to your city. Your visitor might be a non-believer that hasn’t walked into a church before. Your church guest might be one who hasn’t been to a church since they were a teenager, but life circumstances have brought them to your door as something familiar and comforting. No matter their faith background or prior Christian experience, there will be a list. No matter their background story as to what brought them as a visitor to your church, there will be a list. Sometimes that list is clear. In our family, we have a reasonable list of things to look for as we seek what God has for us. It’s perfectly ok for us to pray (seek guidance) and plan (have a list). Our list is flexible enough to bend to our circumstances and options in this city, but that list is a great opening filter. Sometimes that list is vague. Perhaps there was a upbringing in a particular faith tradition and a church visitor is looking for something similar, or something radically different. The criteria is not clear, but it is there. They want a similar experience to their past, or something so different that their past is a contrast. Sometimes that list is unspoken or unconscious. If you were to ask this type of guest what they look for in a church, you might get a simple “I don’t know” or “I’m not sure.” But if you ask them about their experience afterward, you’ll hear their mismatched expectations or a well met expectation. They’ve made a comparison to something. I was once asked in 2008 what I looked for in a church when I was asked to coach them , and here was a short list of things I consider as a consultant. What do you do with the invisible list? As followers of Christ who having planted three multi-cultural churches as an associate pastor, served in youth ministry, and involved in cross cultural missions, we discovered that we had a list of criteria that we measured a church against. Even if we liked our experience at a church, we still ruled cross it off if it failed to meet a lot of our criteria. Visitors will come and go as they seek churches that match some of their criteria. There is not much that a church can do about the whims of such visitors (and I include myself). But, you can use your best guesses to help improve your first impressions ministry. We have visited one church three times as part of this process. In spite of an invasive church greeter that makes me want to use a different entrance door, we have made repeated visits. The music and congregational singing has been a joy to participate in. Each sermon we have heard has been intensely practical. They have featured solid biblical theology, exegetical depth, and a simple structure. For our family, sermon quality is a criteria we bring as we visit churches to decide where to invest our life. Most of all, the each application has been consistently clear. Our family continues the conversation during the week about how to apply the sermon to our own life. Consistent sermon quality is part of the attractional draw that is on our list. Knowing that as part of your grid should drive continuous improvement in your sermons and prepartion. The church greeter who kissed my wife and the greeter that smothered me with a hug are negative impressions that had to be overcome. Your first impressions are important. From the helpfulness of church greeters, to volunteers who smile, to volunteers that ask meaningful questions at the welcome center, to clean bathrooms — all of these play a role in first impressions. First impressions can help make it a no-brainer to return (see this moving story). On my list are positive first impressions. For example: do volunteers seem happy to serve? Are volunteers excited about their church? Do any volunteers notice us a first time visitors? When you realize how important first impressions are, you’ll want to minimize the friction of awkward experiences. Instead, you’ll want to find ways to help your first time visitor get to their seat and experience your church. You’ll want to look for ways to see hospitality as a ministry and not a chore. If you lead your church’s welcome ministry, consider this list a valuable help to find ways to improve your ministry. Next time you are with your volunteers, ask them what they look for in a church. See what is on their own lists and then think of ways your church could improve in the areas those lists reveal. We share some of first time visitor experiences from our 2014 church shopping experiences. You’ll see more evidence of our list in here. We embarrassed the Greeter – Visit #1. I find it interesting that there is a church list. I would not want to be that one person not on that list. I hope that I can remember these tips for the future.